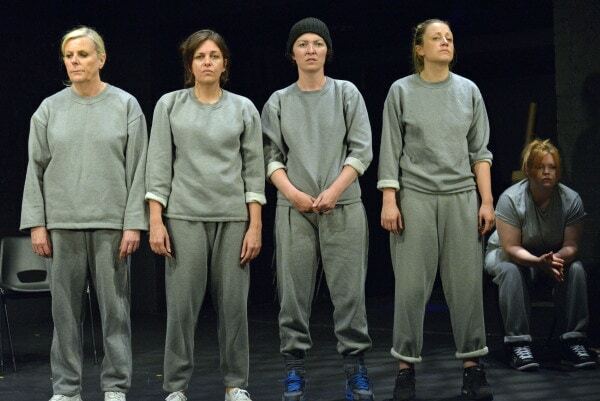 Key Change, a documentary theatre piece about women prisoners in the UK, comes to New York as a prize winner from the 2015 Edinburgh Fringe Festival. Commissioned by Dilly Arts, an arts development company in the northeast of England that works with people in prison, and produced by the Newcastle-based women’s theatre company Open Clasp, the piece was designed to be performed both in prisons (particularly for male prisoners) and for the general public. As such, its ambitions lie both in the realm of education/social change (raising consciousness of these stories, showing male prisoners characters who might help them to see “their complicity in their girlfriends’ and wives’ crimes,” as the programme notes) and in the realm of art. Emotionally powerful and often deeply moving, the piece perhaps succeeds better at its educational, and undoubtedly more important, task. The urgency of these women’s stories, and the common threads that underlie the paths they took to prison – drugs, early pregnancy, sexual abuse – shine through. Arising out of work with the offenders in the UK women’s prison HMPYOI Low Newton and written by Catrina McHugh in spare, colloquial language, the piece effectively and simply evokes the texture of daily life in prison: what it sounds like, how tempers flare among even those who care for each other, how small and meagerly furnished a cell is, the rhythms of roll calls and phone calls and head counts and disciplinary infractions. The four women playing the prisoners paint a fast, impressionistic picture that covers a lot of ground in a brief playing time, from intake to release, with interludes where the women speak in broader strokes: of what they miss most in prison, for example. Director Laura Lindow and choreographer Holly Irving also leaven the action with bits of inventive physicality—an intricate slow-motion fight sequence, or a lovely and poignant moment involving the letters received by the inmates from their loved ones. These moments, as well as a frame in which the prisoners are setting up to tell us their stories, don’t entirely mesh with the rough, unpolished honesty of the stories, but the contrast adds valuable texture. Lucy (Cheryl Dixon) and Angie (Jessica Johnson), the two central characters, seem at first glance quite different: Lucy a little self-effacing, focused on her children, a first-timer who never thought she’d wind up in prison; Angie an aggressive repeat offender, with a hair-trigger temper and a drug problem that overcomes all her best efforts to stay out of trouble next time. Where Johnson crackles with rough edges, Dixon lets Lucy’s timidity and passivity come to the fore. But as the women start to talk about their early lives, and reveal the paths that got them here, we see parallels: both get pregnant in their teens and leave their parents’ homes over it to be with destructive men (Lucy, it seems, left because her parents disapproved of her boyfriend – later husband – Paul, whereas Angie was more thrown out after a fight with her mother, though there’s also a strong suggestion of sexual abuse by her father). Both never really find their way past that first pregnancy or that first damaging relationship. Angie’s boyfriend is in jail by the time their son is born, and after the baby dies she drifts into heroin abuse and a series of equally unhealthy relationships that leave her with more children. Lucy stays with Paul, who’s violently abusive toward her, and has two more children. Their relationship is punctuated by her attempts to leave with the children. And when she finally succeeds at getting away from him, financial instability leads her into the crime that sends her, too, to prison. Dixon and Johnson portray well the wary friendship between Lucy and Angie; there’s affection, but not enough to trump the necessity to look out for one’s own needs first behind bars. Christina Berriman Dawson and Judi Earl, though they have inmate roles as Kim and Kelly (less developed but facing many of the same issues of drug addiction, abuse and early child-bearing), shine when playing the other figures in Lucy and Angie’s lives – the junkie boys who turn Angie on to heroin; Lucy’s daughters; Paul. In front of a New York audience, some of the stories don’t quite pack the punch of recognition they might in the UK; the unfamiliar slang, not to mention the fact that all the inmates are white, adds a definite distance. But the underlying message, – of understanding and compassion for these women, whose difficult lives have led them to places with no good choices, and who are now paying a steep price; and of recognition of their simple humanity at a time when it’s all too easy to look at the incarcerated as individual failures – is evident, and important.